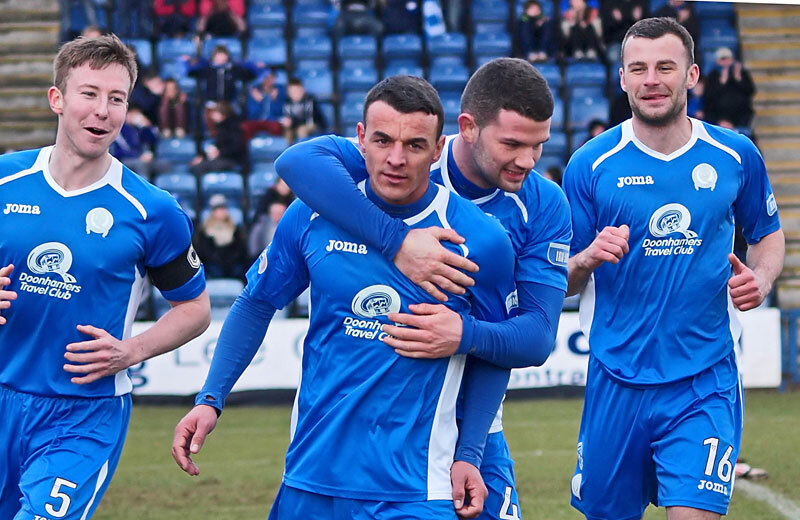 Queens recorded league win number 26 this afternoon as a 2-1 victory saw them overcome Brechin City for the second time in three days, and kept them very much on course to overhaul Gretna`s record points total, with 5 games still to play. Boss Allan Johnston made two changes to the team that started the title clinching game in midweek, with Derek Young, and Marc Fitzpatrick replacing Paul Burns, and Kevin Holt, in what was more than likely to be the team that starts in the Ramsden Cup Final next weekend. Both Michael Paton, and Marc Fitzpatrick, also made their Queens home debuts. Following the heavy defeat in midweek, the visitors made a total of 6 changes to the team that started that game, including loan signings,Gareth Rodger from St.Johnstone who started in defence, and Ryan Ferguson from Dundee United who began on the bench. Before kick-off, the visitors lined up to provide the champions with a guard of honour as they applauded them onto the pitch, which was a very nice sporting gesture from the Brechin management and players. The game began in bright sunshine, and after all the noise and singing as the teams entered the pitch had subsided, the atmosphere around the ground seemed somewhat muted as the game slipped slowly into action. In fact it was Brechin who were first to launch an attack, winning the game`s first corner which was easily cleared by Derek Young at the near post. Playing in their usual 4-4-2 formation, Queens were having plenty of early possession, but were unable to find a way to penetrate a much better organised defence. Twice in quick succession, long cross field passes from Stephen McKenna threatened to open up the visitors back line, but both Danny Carmichael, and then Chris Mitchell had their crosses blocked off at source. With 15 minutes gone, Queens won their first corner of the game after Fitzpatrick did well on the left, and Mitchell`s set piece delivery to the near post was well defended by centre-back Hay. Less than a minute later, Queens took the lead and it was from an identical corner routine. This time Mitchell`s delivery was met by a flick on from Chris Higgins, and his centre back partner, Mark Durnan, was on hand to prod home his 7th goal of the season. The goal moved Queens into another gear, and they almost got in behind the visitors defence straight away, when Carmichael and Mitchell combined well down the right, but after taking the return pass in his stride, Mitchell produced a heavy touch that took the ball out of play. Just short of the half hour mark, leading scorer, Nicky Clark, had his first sight of goal, but Brechin `keeper Andrews, was quickly off his line to block the striker`s effort. 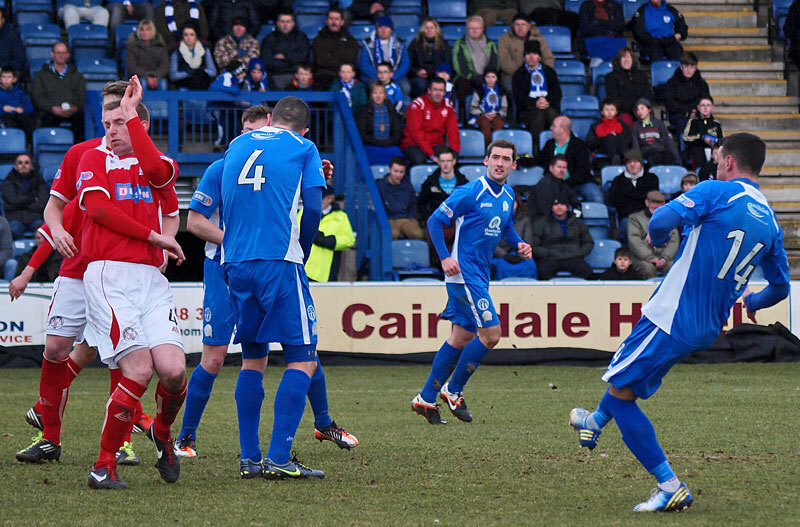 In a rare attack at the other end, Brechin almost capitalised on a Queens defensive error. A harmless looking throw-in bounced into the penalty area, and with the ball not being cleared, it bounced into the path of Ryan Stewart who clipped the bar with a shot from 4 yards out. That was a reel let off for Queens who, although controlling most of the half, were sometimes a little guilty of trying to hit one too many passes in dangerous areas of the field. The visitors created another half chance minutes later, but Trouten`s drive from 25-yards was too straight, and Lee Robinson saved comfortably. Five minutes before the break, Queens, and Mark Durnan, came close to scoring again and only a fine one-handed save to his right by Andrews kept the big centre-back`s header out, with Young blasting the follow up high over the bar. That was the last of the action in what was a fairly comfortable forty-five minutes for Queens, but the lack of real scoring chances was mainly down to a much more organised Brechin defence, rather than Queens not creating any opportunities. The visitors started the half in determined fashion, and they won the first corner of the half a minute in, but the high,hanging delivery from the right was well taken under pressure by Lee Robinson. Queens were a bit slow to get started,but eventually their passing game began to take effect, with Stephen McKenna in particular, spreading the ball around precisely and confidently. A well flighted cross from Fitzpatrick looked to be heading straight for the head of Clark, but Rodger`s timely interception prevented what would have almost certainly been another goal for Queens` leading scorer. With manager Allan Johnston probably looking ahead to the forthcoming cup final, on 57 minutes, Queens made a double substitution, as Derek Lyle, and Willie Gibson, replaced Nicky Clark, and Danny Carmichael. The two substitutes combined well and almost made the perfect introduction 3 minutes later. Gibson`s delightful cross was met by Lyle`s glancing header from 12 yards, but with the `keeper rooted to the spot, the ball smacked off the base of the post. The champions were really well in control at this point of the game, and a long range effort from McKenna, was swiftly followed by a shot from Michael Paton that was deflected for a corner,that was eventually cleared. The next chance fell to Gavin Reilly. The striker, whose goal against Brechin in midweek was the 100th competitive goal Queens have scored under manager Allan Johnston, got in behind the defence but he sliced his effort wide of the far post. Queens final change saw Kevin Smith replace Reilly, and 6 minutes later, Queens doubled their lead, and once again the goal came from another set piece. Mitchell`s delivery from a right wing corner was met on the volley by Derek Lyle at the far post and his well placed shot flew into the bottom corner of the net past a posse of Brechin defenders. The cheers had only just died down when Brechin were awarded a penalty after Durnan was judged to have fouled Jackson in the area. The Queens player was cautioned, and Trouten placed the spot-kick away from Robinson`s dive to bring his team back into the game. With 10 minutes left, Queens were left with just ten men after Stephen McKenna was forced to leave the field with what looked to be a dead leg. Brechin then produced their best move of the game. Starting in midfield, the ball eventually found it`s way to Trouten and his powerful drive forced Robinson into making a smart stop at his near post, pushing the ball away for a corner. At the other end, a Kevin Smith effort drew a smart stop from Andrews, and as the game moved into the final minutes,Queens were down to just nine men when Willie Gibson suffered a leg injury and had to leave the game. There were no more problems for Queens to deal with, and the final whistle signalled another win, three more points, and the unbeaten home league record remained intact. Sponsors named Mark Durnan as man-of-the-match, and the crowd of 2026 , rose as one to acclaim the 2nd division champions as they remained on the Palmerston pitch for a few minutes at the end of the game. I`m absolutely certain that the players will remain on the field for a much longer time in a few weeks, when one, and possibly two trophies are presented. After such a convincing display against Brechin in midweek, it was always going to be hard for Queens to match that performance, and although the result went the correct way for the champions, the performance was a little bit flat, and maybe that was to be expected, as after all the team can`t be expected to win stylishly in every game they play. 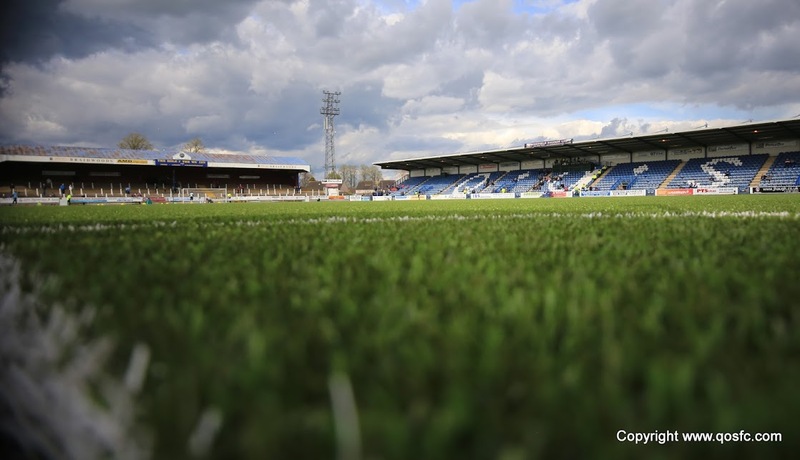 Good luck, to the players, the management, and everyone connected with Queens in the final next weekend, here`s hoping that this fantastic season continues in positive fashion. 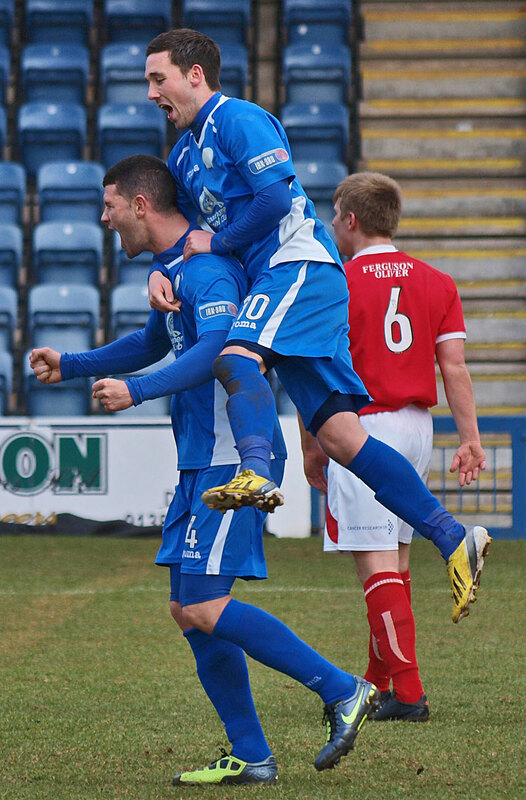 14:38 Howdy folks and welcome to the Second Division title party as Queens face Brechin for the second time in a week. 14:46 And we are refereed today by Greg Aitken who is assisted by Craig Young and Craig Winning. 14:56 Two changes in the line-up today as Fitzpatrick and Young come in for Holt and Burns as Queens look to keep the great form going. 14:57 And if they play half as well as they did on Wednesday when they hammered Brechin 6-0 then we should be in for some goals today. 14:57 Brechin were no doubt chastened by the midweek mauling they received at the hands of Queens and they`ll be trying to keep it tighter. 15:01 Brechin`s players are out first and are honouring their opponents with a guard of honour. A nice touch. 4 min Well, that`s 3 minutes and no goals! Much tighter this time - Brechin have had a corner and that`s about it. 5 min Queens are in their usual 4-4-2 with Clark and Reilly up front, Carmichael on the right and Paton on the left. Brechin are 4-5-1. 14 min Pretty low key start with Queens dominating possession and looking for a route through the organised Brechin defence. Slow going at the mo. 18 min There we have it. Mitchell swings in a corner from the left which Higgins flicks on for Durnan to net his 7th of the season. 24 min It`s been Queens` attack against the Brechin defence so far and looks like the away side are determined to avoid another beating. 26 min Chance for Queens as Nicky Clark gets in behind the defence and tries to poke the ball past the goalkeeper who blocks well. 31 min Off the bar! Massive chance for Brechin as Ryan Stewart gets a lucky break and finds himself 6 yards out but can only hit the bar. Big miss. 35 min Nice hit from Brechin`s Alan Trouten as he stings Robinson`s hands with a shot from 25 yards but no trouble really for the Queens stopper. 39 min Good save! 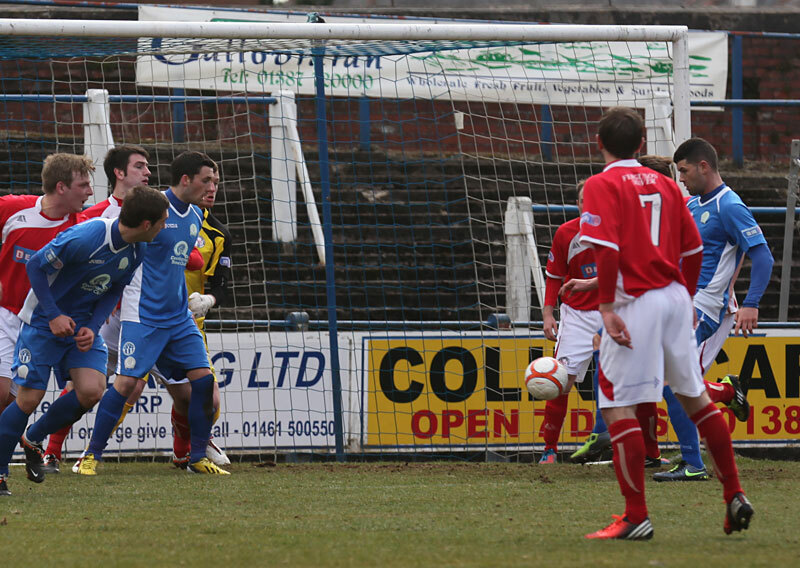 Andrews claws out Durnan`s header before Derek Young wildly blasts the rebound wide. Half Time Anyone expecting a repeat of Wednesday night`s performance will be disappointed but it`s been a good showing with the home side well on top. Half Time Today`s attendance is 2026. 51 min First chance of the second half as Marc Fitzpatrick sends in a deep cross for Clark to attack but the Brechin defender heads clear. 57 min The second half has the same flow as the first with Queens struggling to find gaps in Brechin`s, at times, 9-man defence. 61 min Off the post Lyle! Pretty much his first touch since coming on and Derek Lyle rises to flick a Gibson cross onto the far post. 68 min Brechin`s Ryan Ferguson has a pop from long range but Lee Robinson is untroubled as it flies wide. 71 min Brechin`s top scorer Andy Jackson is almost in and certain to score before Chris Higgins manages to poke the ball behind. Good defending. 73 min Cracking finish from Derek Lyle as he peels around the back to meet Mitchell`s corner flush on the volley and finds the corner. 73 min Penalty to Brechin. 76 min That`s taken the edge off the Queens celebrations as Brechin get a soft penalty and Trouten finds the corner. 79 min Queens will have to finish the match with 10 men as Stephen McKenna picks up an injury and has to go off. Probably just a precaution. 83 min Good save Robinson! Brechin get behind the Queens backline and Trouten smashes it goalward only for Robinson to push it behind. 86 min Queens are having to defend at the moment as Brechin look like they fancy stealing a result after Queens went down to 10 men. 89 min The ball breaks to Kevin Smith inside the area and he brings a decent stop from the Brechin `keeper. 90+1 min Now Willie Gibson is down with an injury. Worrying signs with the cup final next week. He can`t continue. Down to 9 men now. 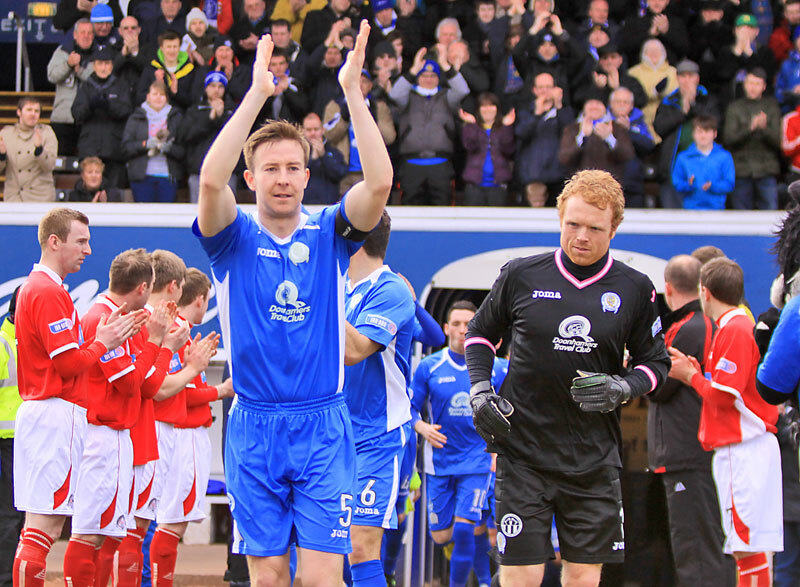 16:53 The Queens players take the applause from the crowd as `Championes, Championes` rings out around Palmerston. Another good win.